Located on Píngjiāng Lù, one of the old streets in Suzhou, Mike’s Hot Dogs is an unlikely find. Opened in May, 2014, Danish expatriate Mike Matthiesen and his wife, Xiapeng Zhu, are counting on the novelty and good taste of a German hot dog recipe to bring a different snack food to both Chinese and western foodies. Probably the last thing I expected to see while strolling along one of the old streets in Suzhou, China, was Mike’s Hot Dogs. I looked at the sign and my mind would not compute; I’m like, “This doesn’t make sense.” It was a total non sequitur. Píngjiāng Lù is one of the old streets (Lù is the Chinese word for street) in the ancient city of Suzhou, which was established about 2500 years ago. Many of the tour guides recommend taking the time to visit the street, and if I were to write a tour guide, I would recommend it, too. Do not go to Suzhou without visiting this street. And when you come to Mike’s Hot Dogs, stop and say hello to Mike Matthiesen and his lovely Chinese bride, Xiaopeng Zhu, who also goes by JC. Mike is a Danish expatriate and just two weeks ago he and Xiaopeng opened their hot dog store on Píngjiāng Lù in Suzhou. Hot dogs in China? Only rarely do you find them. And if you do, the sausage is likely to be made from a Chinese recipe. One of the really different tastes I have encountered in China is that of Chinese sausages. They look very much like sausages in the U.S., but taste quite differently. Mike noticed that, too, that is, with regard to how sausages taste in Europe. So he acquired a sausage recipe from a German butcher, bought all of the ingredients locally (except for those that had to be imported), and took them to a local processor who makes the hot dogs according to Mike’s specifications. 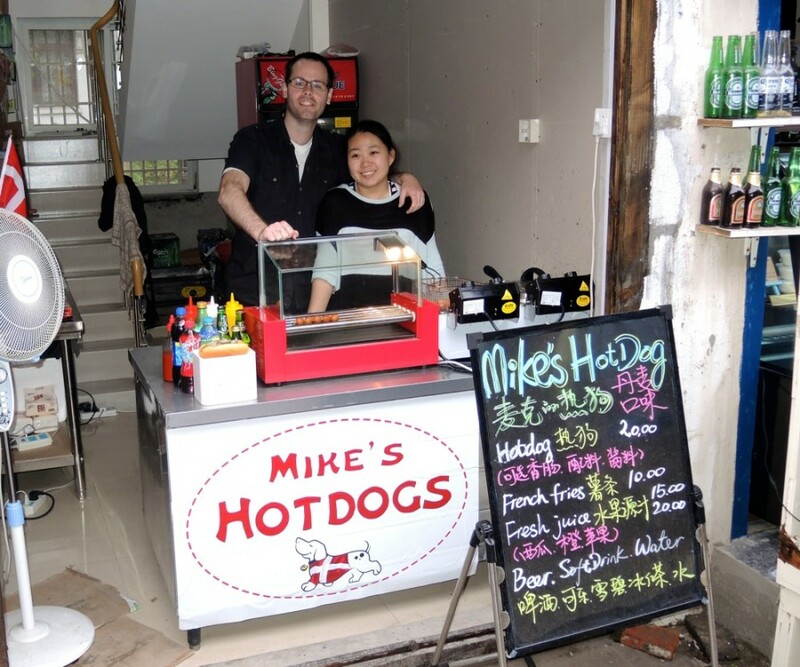 Mike’s Hot Dogs of Suzhou now offers german-recipe hot dogs, a rarity in China. Mike’s specs call for a 17 cm (almost 7-inch) hot dog served on a 15 cm bun. There is a cheese-dog version, too. And for the 20 yuan ($3.20) price, he will dress it for you on a toasted bun with chopped red onion, jalapeño peppers, a bead of mayonnaise, mustard, pickle, and hot sauce if you want it. At least, that was the one I ate. I am from a small German community in Minnesota that has a long tradition of sausage making. I have to say, what a pleasure for me to discover this tasty hot dog in Suzhou. Here is the thing about hot dogs in China: for the Chinese, it is somewhat of a strange, western food. Such food items interest the Chinese, many of whom like to explore western cuisine. For travelers like me, the “real” hot dog offers a taste of home. My wife and I have lived in China for extended periods. We have tried all manner of Chinese food and, overall, we love Chinese cuisine. But periodically, we have a longing for something familiar. And while we eschew the myriad McDonald’s and KFCs found in every major city in China, we do occasionally seek out those western restaurants who know how to make a good hamburger. In the case of Mike’s Hot Dogs, it was a hot dog, and it fit the bill perfectly.